A few weeks ago when I was at the library digging through old archives for work, I picked up a Discover Sevierville TN pamphlet as I waited for the elevator. I didn’t think much of it and stuck it in my purse. Honestly, I completely forgot about it until a couple of days ago when I was cleaning out my computer bag. 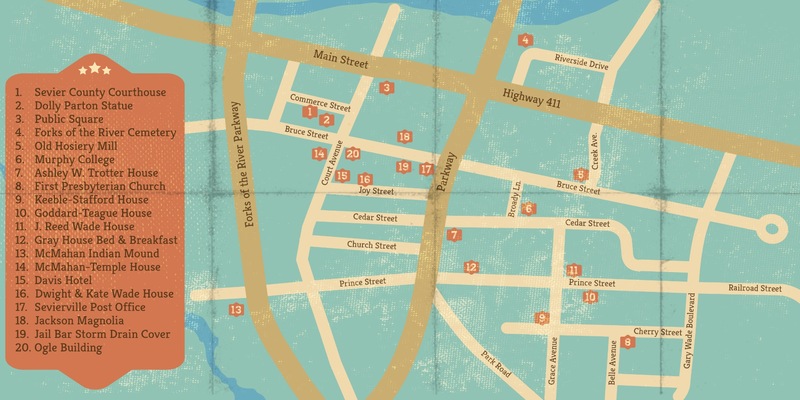 And like any new resident, I decided to look into this walking tour adventure. We took a walk back in time to discover the rich history of our new home. Some of the places I was familiar with, others I had never even heard of. 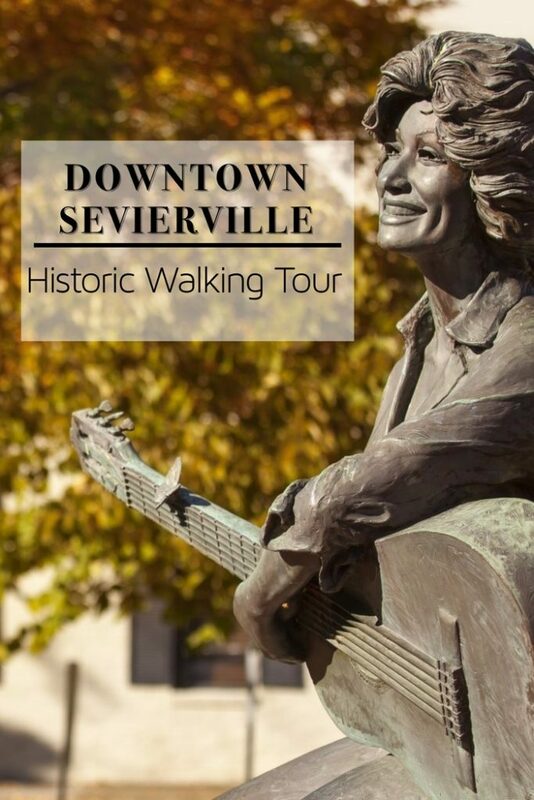 As new residents in Sevierville, we are all about exploring! 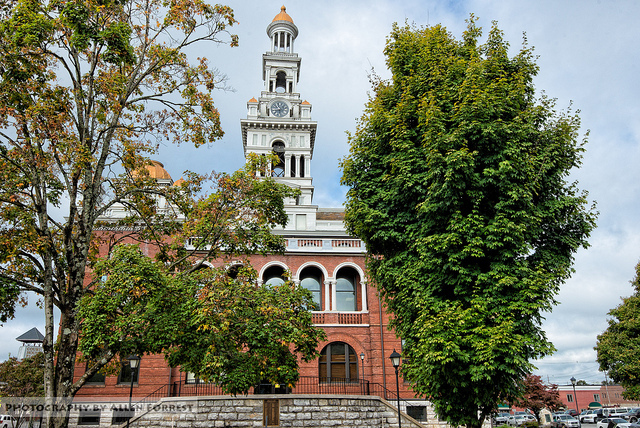 On the banks of the Pigeon River, nestled in the Smoky Mountains is Downtown Sevierville TN. Home to Dolly Parton and now the McKennas, historic downtown is really something special. And this walking tour shows that there is history and culture here! First stop on the tour? The court house. This is the fifth court house the county sees and is an example of Victorian architecture. The brick walls are 13 inches thick! It is said that the court house is perhaps the county’s most treasured landmark and it is easy to see why. If you ask me, this was the perfect place to start our walking tour of the Downtown Historic Sevierville, TN. Few sculptures really capture the personality and essence of the person they aim to represent, feeling sometimes cold or lacking that sparkle in their eye. Jim Gray’s Dolly Parton is not one of those! The statue comes to life as you look at the contagious smile Dolly has that is known to light up a room. And as someone who has met Dear Dolly, I can tell you that the statute is an amazing representation of who she is. 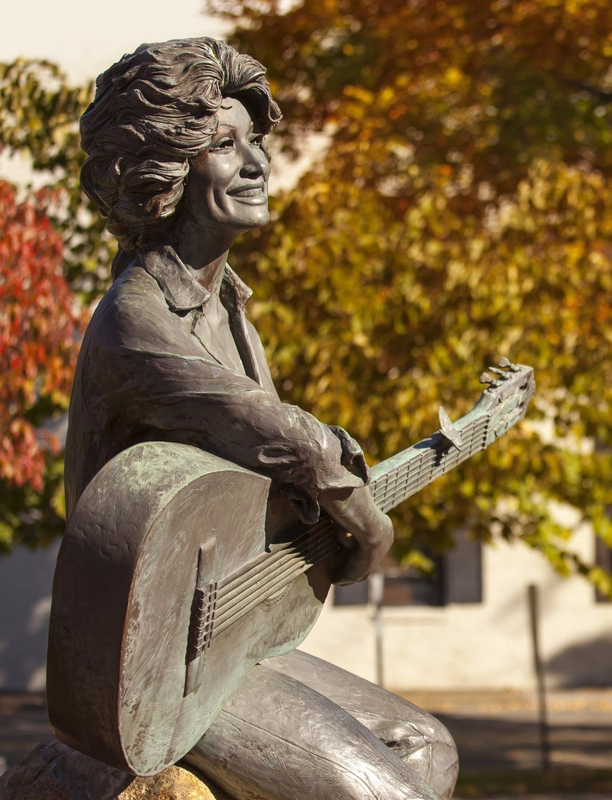 Commemorating her roots, the statue depicts everyone’s favorite Smoky Mountain girl playing a guitar barefoot in her hometown of Sevierville TN. We don’t have enough public squares in present day life! A central part of communities and a hub of activity, public squares were once the heart and soul of towns around the country. Created in 1856 after the court house burned, the square is lined with big shady trees that are perfect for an afternoon stroll! One of the first historic sites I noticed in town (because you know how much I love cemeteries), this cemetery is where many of Sevierville’s founders and pioneers call this their final resting spot. The site of The Forks of the Little Pigeon Baptist Church was never rebuilt after the congregation disbanded during Civil War times. A main source of employment for the town and built in 1920, the Loudon Hosiery Mill was around for almost 40 years. The building still stands today and produced nylon, cotton, and silk hosiery until 1954 when it closed. A building heavy with an education history that goes back, it is the current home of the Sevier County Board of Education. In 1892 it was the home of Murphy College until 1923 when it moved to its new site on Park Road. The beautiful Victorian style house was built by Dr. Ashely W. Trotter in 1892. Currently a private residence, the house’s gingerbread trim gables and butterfly wings were done by Artisan Lewis Buckner a skilled African American craftsman. Built in 1917 and costing $3,992.69 the First Presbyterian Church was designed by R.F. Graf & Sons. The Church is the oldest building in the city that is still in use! Make sure you check out the stain-glass windows when you walk by. The house was built by James R. Keeble, a professor at Murphy College, and later owned by Thomas Stafford, a local railroad engineer and businessman. The house features 3 fireplaces! Another Murphy College professor house, Elmer F. Goddard. A manual arts professor, Goddard purchased the vacant lot in 106 and constructed the elaborate house that he himself designed. Murphy College later purchased the house and used it as a girls dorm. Though the house is a private residence, it isn’t hard to see the importance and beauty it holds. The house is a colonial-style clap-board structure with small porches and large white columns. The house features a fireplace in every room! The Wade house was built by Mayor J. Reed Wade who served as Mayor from 1945 to 1946. This bed and breakfast’s history goes back to 1899, when a planning mill on the property was built. The mill that produced the lumber for all the houses on Prince Street was later dismantled and the house was built. Excavations in 1881 unearthed burials, arrow points, brass pins, glass beads, and other important artifacts. Though smaller now than it would have been, the site’s findings show that the area was once occupied by Dallas Phase peoples of the South Appalachian Region and during the time of the European contact in the American southeast. The Pines Theatre opened in 1944. In addition to motion pictures, it also featured live performances like Archie Campbell, The Carlisle Brothers, Hotshot Elmer, Chet Atkins, Roy Acuff, and the Carter Family. Known today as Rawlings Funeral home, the building was once a twenty-two room hotel that had hot and cold running water in all rooms. The red brick building was converted in 1935 to a funeral home. And in the 1950’s the funeral chapel was added. The Dwight and Kate Wade house was completed in 1940 and a near replica of the Garden Home in The Town of Tomorrow exhibit at the New York World’s fair of 1939-1940. Dwight Wade lived in the house until his death in 2008 at the age of 101. One of the best, if not the best, examples of Colonial Revival architecture in the county. 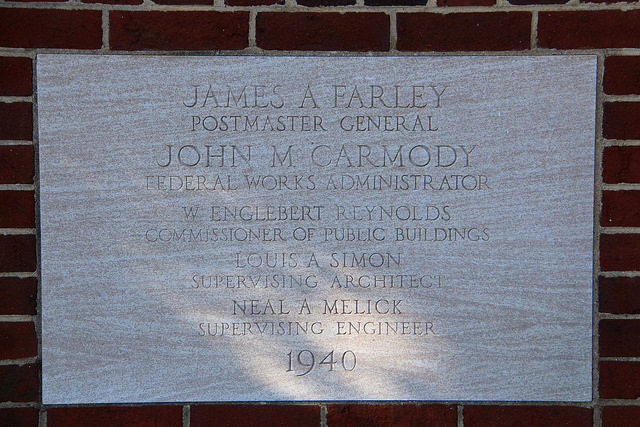 The post office was built by the Works Progress Administration in 1940 for $75,000. The building was designed by federal architect Louis A. Simon and Neal A. Melick was the supervising engineer. It is based on the standardized architectural plan for federal post offices constructed by the WAP all over the country. The building is currently used as the Sevier County Heritage Center. The Jackson Magnolia is probably one of my favorite sites on the walking tour because it is a perfect mix of things I love- history and nature. On September 13, 2013 a ceremony was held to plan a cutting from the Senator Howard Baker’s Magnolia. The tree had grown from the Andrew Jackson Magnolia at the White House. The cutting was given to Judge Rex Henry Ogle who donated the sapling to the City of Sevierville. A weird site on a walking tour that is filled with historical significance! The storm drain cover is one of 2 remaining grates that were crafted from salvaged prison bars belonging to the old jail. The jail, and most of downtown, burned in a horrific fire in 1856. Located across the street from the gazebo at the back of the graveled alley, the other remaining grate is located on the north side of the courthouse in an alley just East of Lera Court. Once done with the walking tour, if you are still feeling like Indian Jones looking to keep exploring you find US 441 where you will find some amazing barns. See Rock City Barns were once as prolific as Burma Shave Signs. Now only about 80 or so remain.There are five barns on 441 between Sevierville and Seymour and two more up 441 towards Chestnut Hills. There is so much to do in the area so make sure you check our some of the dinner shows and attractions! You can get tickets to almost anything in town and find great hotels via VacationsMadeEasy.